I’ve been more peripatetic than usual lately; we subletted our apartment in anticipation of a visa that was a month late in coming so I’ve been housesitting all over the East Bay. I’ve stayed in four different places, all inhabited by archaeologists–I’ve started making jokes about how I’m studying their settlement patterns. I thought about drawing plans of the layouts of the houses, but then felt like it would be an invasion of privacy–so what kind of implications does that have for archaeological practice? Anyway, last Saturday night I took the bus down from my latest domicile in Richmond to check out Endless Canvas’ unbelievable “Sistine Chapel” of graffiti art in a warehouse in West Berkeley. It was held in the former Flint Ink building, a warehouse that has been vacant since 1999. When I walked up to the warehouse I was stunned to see a huge line full of families along with the requisite cool kids. 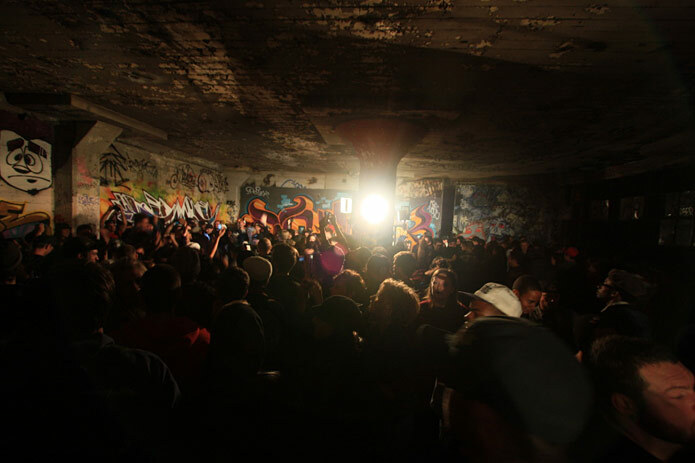 The three floors of the warehouse were lit with industrial spot lights and there were multiple DJ setups, infusing the concrete with thudding hip hop and techno. The building was absolutely covered and I walked through the warehouse several times, up stairs, looking down elevator shafts and out onto the nearby train tracks. 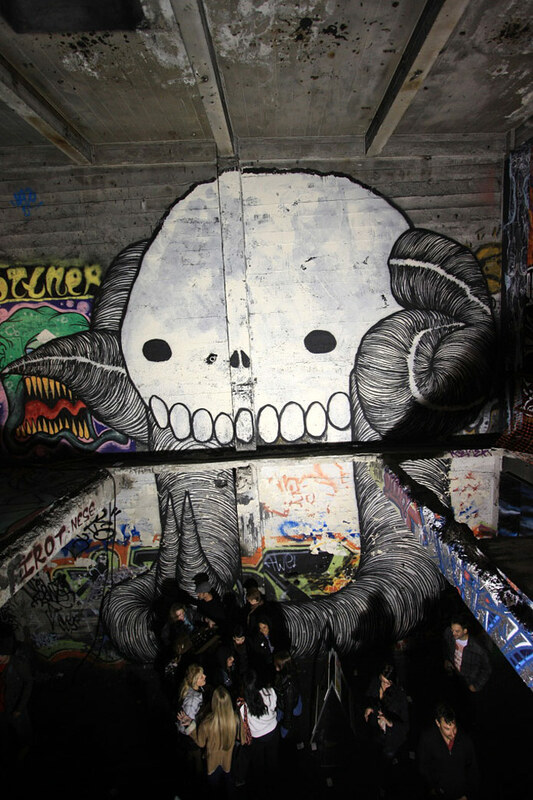 Along with the photographs are a series of videos that show the intense connection to place that graffiti artists have and how they express this through their art. 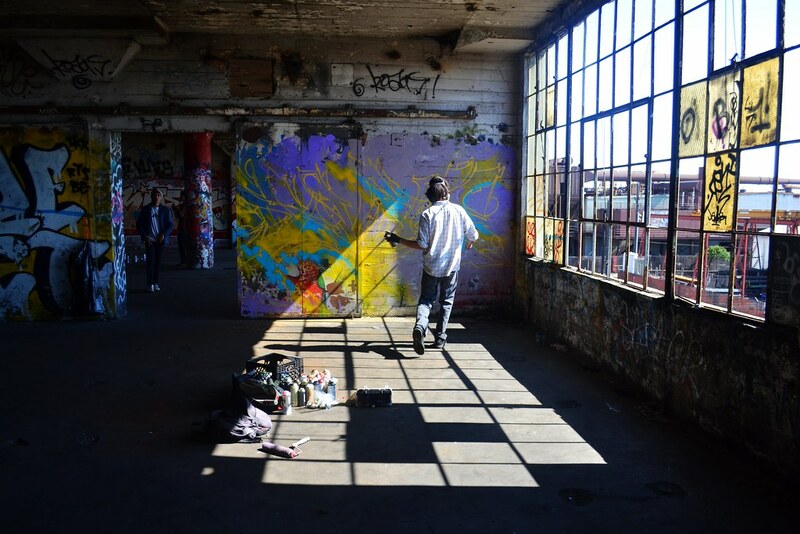 The videos also features a “buffer,” a guy that goes around and paints over the graffiti art and so is deeply familiar with all of the different artists. When I walk through Oakland the graffiti resonates so strongly with my experience of the city. New pieces, old pieces, new artists, artists referencing each other–it’s an intense dialog with place that can be both intimate, you won’t see certain pieces or stickers unless you walk the street and grandiose, such as the huge pieces that welcome you back to Oakland after you go under the Bay in the BART. Graffiti in Oakland is a passionate expression of defiance and home and I feel deeply lucky that I managed to be around for its effloresce. Perth was invaded in 2006 by a a strange looking being–it had large eyes, a nose, and no mouth, but an oval shape beneath its neck and an aura. Stencils of this creature quickly covered all available surfaces, and just as quickly was commented on in the press and by the indigenous aboriginals of the western Kimberley region of Western Australia. The wandering Wandjina, a powerful being who was “the supreme spirit of the Worrorra, Ngarinyin, and Wunumbul people of Australia,” the one who “emerged from the sea and the sky, created the landscape, then returned to the spirit world,” but not before leaving their mark on rockshelter walls was reborn as a graffiti stencil on the streets of Perth. In her Archaeologies article, Ursula Frederick studies the phenomenon of the Wandering Wandjina as part of a fascinating journal article on the interplay of traditional iconography and graffiti art in Melbourne and Perth. 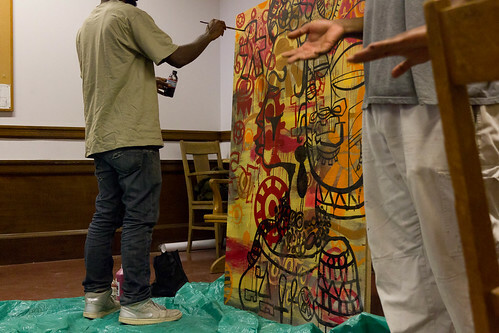 The above quotes are from this article, Revolution is the New Black: graffiti art and mark-making practices. 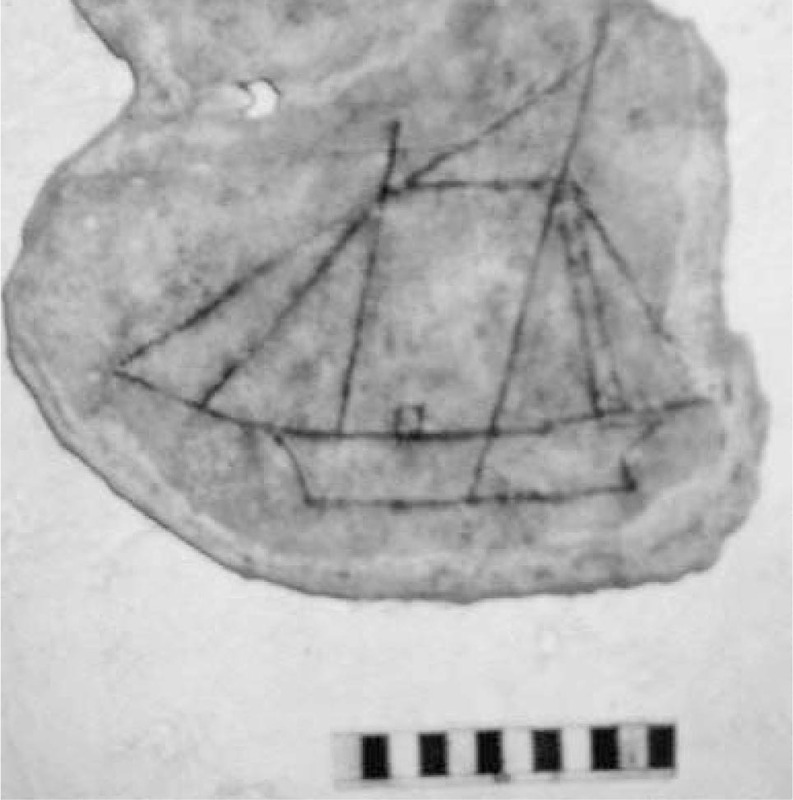 In this article Frederick outlines her methodology in studying the graffiti from an archaeological standpoint, rather than that of sociologists who have attributed this art to social malfiescance and the like. She contrasts traditional studies of rock art with her observations about graffiti, coming across interesting questions that could inform traditional study of ancient art. 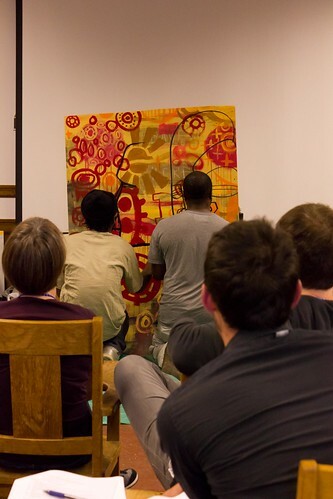 For example, she notes the different media used to create tags (pen, crayon, spray paint) and the limitations inherent in each method of tagging–the technology directly influences the size and complexity of the art. This may seem overly obvious to fans of graffiti, but in rock art size is linked with importance, or dominance, rather than functionality. Frederick also disturbs our archaeological interpretations of rock art having a single meaning, and being viewed by a homogenous community who views this art in a single way. It would be difficult to find people who share the same interpretation of graffiti. I’m sure that more progressive researchers of rock art are already exploring this alternate approach, but the example in modern graffiti is well taken from Frederick. Given these questions, I believe that Frederick has provided a great example utility of contemporary archaeology and its role in informing our larger discipline. Archaeology is necessarily a big tent–we do study the whole of human experience, after all. Why give ourselves arbitrary rules and limits? Electronically leafing through archaeological marginalia is probably an overly-obvious habit of mine, and occasionally I’ll find fascinating bits that I’ll throw up on my tumblr blog, to put aside for later while I get back to the main research topic at hand. I’ve been looking into the serious study of graffiti within archaeology for a project I have brewing, and some unexpectedly wonderful things have came up. Ocean-sailing vessels at anchor, Nassau Harbour. One has masts and smoke stacks. 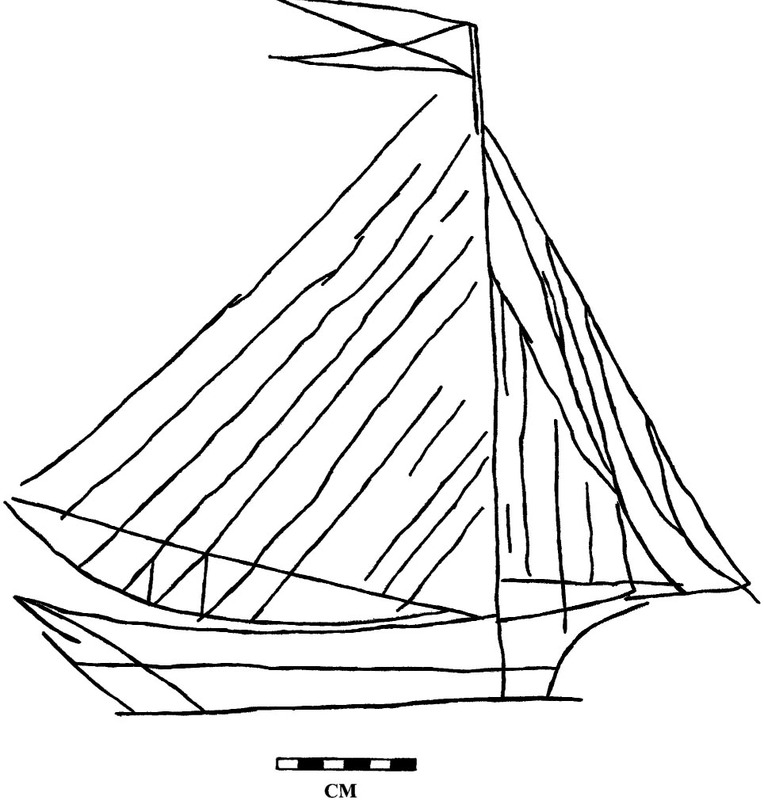 Yet these graffiti-ships “do not appear as decorative or representational images in other Bahamian contexts,” implying (as Carver says, that “Bahamian ship graffiti did not serve any aesthetic or decorative purpose.” She then connects the graffiti with a tradition of “wrecking” which involves both the court-endorsed practice of salvage and a more clandestine practice of putting lights on the coast in improper places, for ships to follow and crash upon the rocks. Turner also describes each of the sites in detail, considering where the graffiti occurred, who was living there at the time, what tools were used to inscribe the stone and plaster surfaces, and even how much light was available at the time. 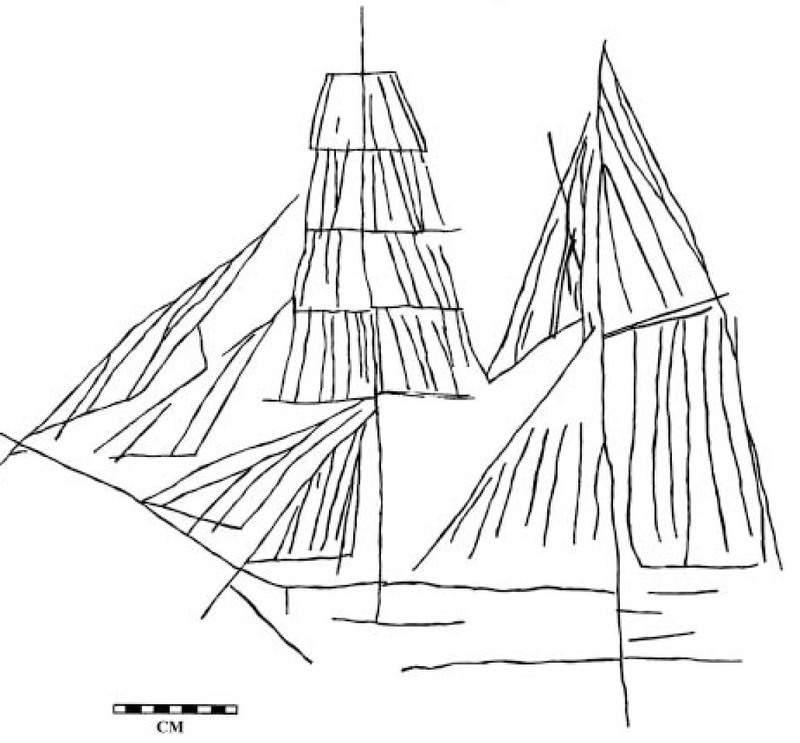 Her conclusions about the socio-economic status of the graffiti artists and their intentions in depicting these ships trails off a bit–like a good archaeologist she’s trying to consider more than one explanation for these phenomena. If these lower-classed Bahamians were making plans and wrecking ships it certainly implies a willingness to prey upon the very same ships that might have brought them to the New World. Kudos to Grace Turner and her interesting research! 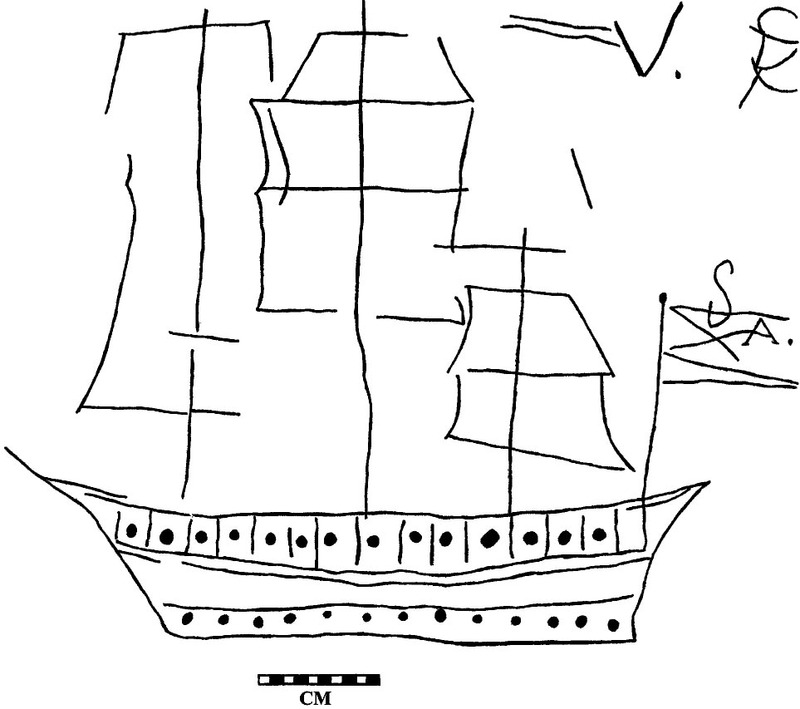 It must have been difficult to locate and draw all of the ships for her project.